Statistics Denmark has published revised figures for the Danish national accounts, government finances and the balance of payments. On September 15th the national accounts and government finances have implemented the new European guidelines in the European System of National and Regional Accounts, ESA 2010, which all EU countries must implement no later than by the end of September 2014. Likewise, the balance of payments has implemented new guidelines, Balance of Payments and International Investment Position Manual 6th edition (BPM6), on October 9th. Parallel to the transition to the new international guidelines, a revision of data and methods has been carried out as well, improving the quality of the statistics. The national accounts were revised back to the initial year of 1966. The effect of the revision varies between the individual years, but for every year it has resulted in an increase in GDP of between 1.6 and 3.1 per cent. However, for the period following 2008 the effect of the overall picture of the major revision cannot be isolated from the ongoing revision of sources which is also a part of the preliminary calculations. 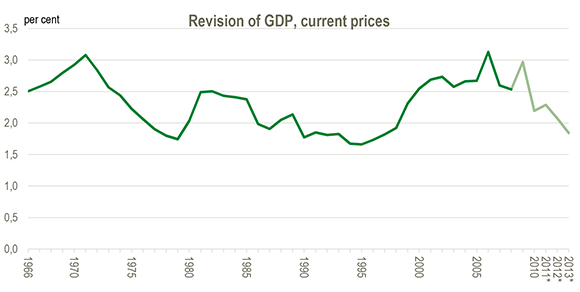 The revision does not affect the overall picture of the economic growth in the period since 1966. The purpose of the new guidelines is to ensure that the national accounts in the best possible way reflect the development of the economy. As a result, one of the elements of the revision is that value created through research and development is calculated and included in the same way as production of other goods and services. The article in News from Statistics Denmark gives a brief overview of a number of the main results of the revision, while the net magazineBehind the Figures clarifies that the revision results in a lower tax burden. The theme publication National accounts and government finances – ESA2010 clarifies the changes and the effects more in-depth across the revision, just as the effects are summarized in the menu item Main effects of the revision to the left. Read the press release, also in Danish. Eurostat published their preliminary estimate of the effects of the revision on GDP in the individual EU countries on January 16th 2014. Their estimate only includes changes in the international guidelines. Eurostat continuously publishes results and documentation concerning the revision on their website. Both the financial accounts and the current account have been revised The National Bank of Denmark is responsible for the revision of the financial account. With the implementation of the new international guidelines, some additional questions have been included in the questionnaire on International trade in services. The new variables have made it possible to validate the information by comparing more directly vis-á-vis other statistical domains. Against that background, Statistics Denmark will map the foreign activities of selected larger Danish enterprises during 2015. Among others it is expected that the validation will affect the distinction between processing and merchanting activities. Further it is expected that the current level of goods sold abroad after processing abroad will be adjusted upwards. 3 June 2014 Program and presentations from Workshop for educators at the further educations. 12-13 June 2014 Eurostat conference in Luxembourg, "The accounts of society"
19 August 2014 Workshop for economic journalists and commentators. 20 August 2014 Publication of the Beta version for select annual data up to and including 2008. 15 Sept. 2014 Publication of the revised annual national accounts for the years 1966-2013. 25. Sept. 2014 Publication of the revised quarterly government finances. 1st quarter 1999 - 2nd quarter 2014. 9 Oct. 2014 Publication of revised monthly balance of payments from January 2005 – August 2014.